Brief Description: Will you be a roaring lion or a quivering mouse as you attempt to face the villains of this book, i.e. the 1,000 challenging quiz questions that will have your minds hopping through over a hundred years of Aston Villa’s history at lightning pace? No stone remains unturned in terms of question topics, from cherished players, memorable managers and thrilling competitions to opponents, transfers, nationalities and awards, interspersed with sneaky bits of trivia to test the knowledge of even the most ardent Villa aficionado. With a fitting foreword by Graham Taylor OBE, this book is a veritable mine of interesting facts and figures and is guaranteed to spark fond memories of much-loved characters and enthralling matches, and no doubt even heated discussion, as fans pit their wits against family and friends. Special Note: £1 from every copy of the book sold will go to 'Sense' Charity and 50 pence from each book sold will go to 'The Aston Villa Former Players Association'. This book is also available as an ebook. Philip Solomon: Philip is a medium who writes columns for various newspapers and a presents his own radio show on Radio Wolverhampton. 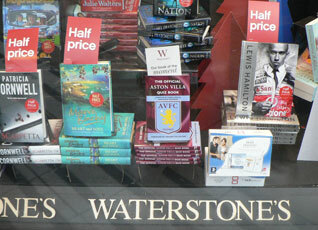 A book packed with facts and figures on the Villa, enough to test any Aston Villa fan. 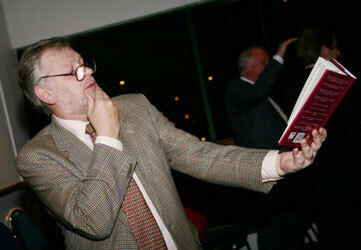 (Photo: Brian Little with a copy of 'The Official Aston Villa Quiz Book'). 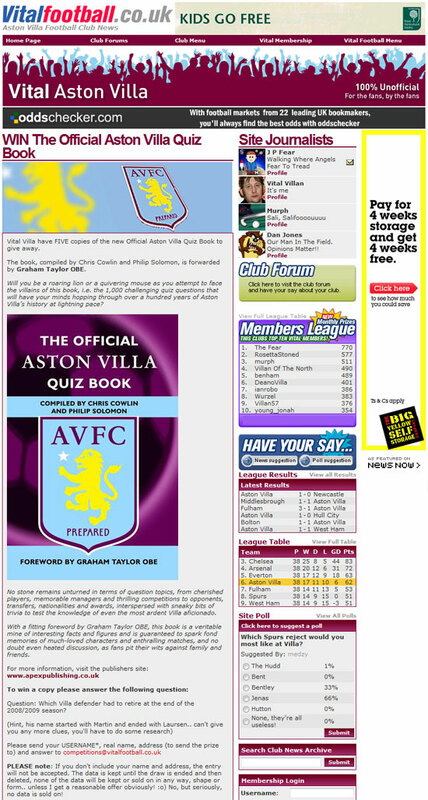 A quiz book for all ages, a must for any Villa fan! 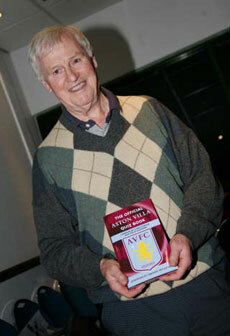 (Photo: Peter McParland with a copy of 'The Official Aston Villa Quiz Book'). A true test for any Villa fan, with 1,000 questions this is sure to keep you entertained for hours! 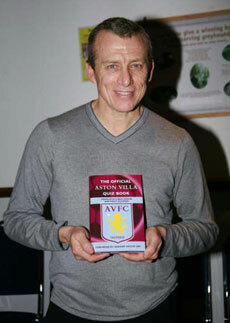 (Photo: Tony Morley with a copy of 'The Official Aston Villa Quiz Book'). Many interesting and diverse questions covering all aspects of Aston Villa, and to suit all abilities. 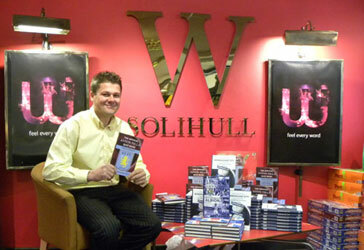 A very comprehensive quiz book that will be of great interest to all Villa fans - and help to keep them entertained. There were some questions I could not answer, although the ones I could bring back fond memories. 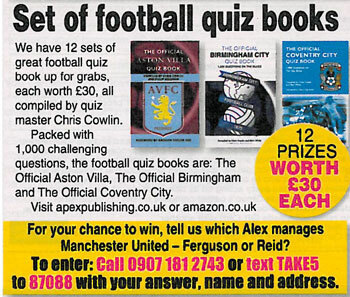 A great quiz book for all Aston Villa fans. A wonderful set of questions, perfect for any Villa fan. 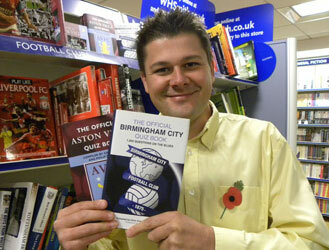 Have as much fun with this book as I did with Aston Villa! 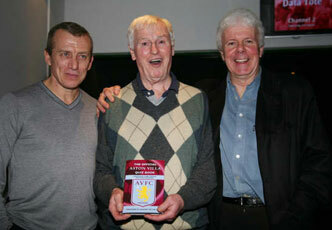 (Photo: Tony Morley, Peter McParland and Charlie Aitken with a copy of 'The Official Aston Villa Quiz Book'). A book packed with facts and figures on the Villa, a must for all fans of the club, it's great to see that a charity and our former players association benefits with the sales of the book. I think this book is absolutely superb. The range of questions, spanning so many decades is interesting and at times extremely informative! 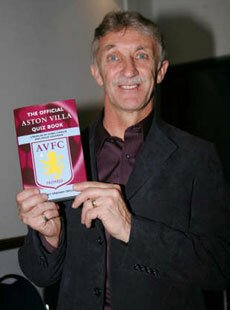 (Photo: Des Bremner with a copy of 'The Official Aston Villa Quiz Book'). A must for any serious Villa fan. Hours of informative fun and "frustration!" Chris and Philip deserve a lot of credit for the incredible amount of research they have done. 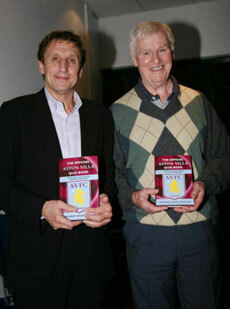 (Photo: Frank Carrodus and Peter McParland with a copy of 'The Official Aston Villa Quiz Book'). This quiz book has it all, facts, figures and information about Villa, it's nice to see that a charity and the Aston Villa Former Players Association are benefiting as well. Aston Villa has a great history and tradition. A quiz book that covers the whole spectrum of Villa life - a fantastic read! A must for all Villa fans from all generations. A superb test of any Villa fans knowledge. I can recommend this book as the interesting questions cover every aspect of the clubs history. 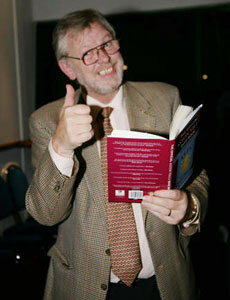 I've always enjoyed quizzes and this book is great for all Villa fans to refer to and get enjoyment from. I really enjoyed looking through it. Congratulations on a well presented quiz book. The variety of questions ensures that both young and old can enjoy the Villa experience, past and present. 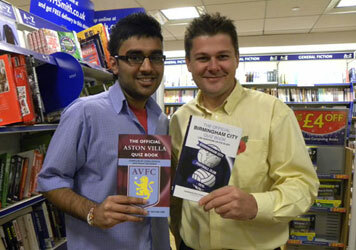 This book will test the biggest Villa fans around! A great set of questions to try and tackle, you will have fun with these 1,000 questions. 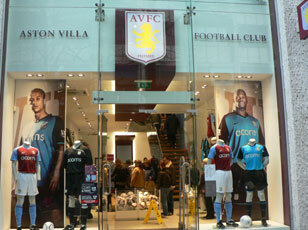 Aston Villa fans prepare to dig deep into 'Villa' history. Very entertaining and extremely well written. Questions to test the memory banks of young and old supporters alike. 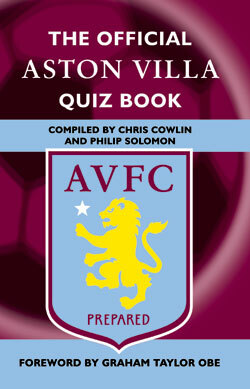 This quiz book is a must for all Villa fans. 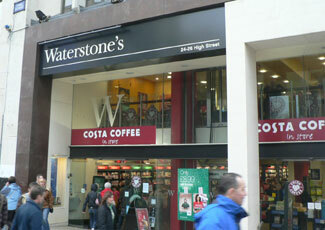 An excellent read that will test the most ardent of Aston Villa fans! 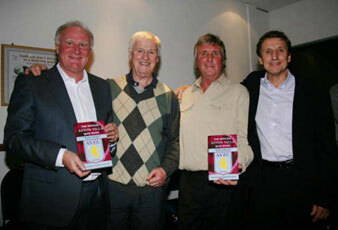 (Photo: Leighton Phillips, Peter McParland, Ian Hamilton and Frank Carrodus with a copy of 'The Official Aston Villa Quiz Book'). What a fantastic idea. This book is a must for all Aston Villa fans because it has it all: the history, past players, the glory years and so much more. I thoroughly enjoyed it all. 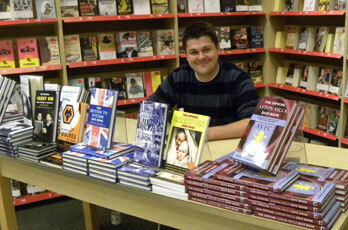 Superbly researched and presented, a great treat for all Villa fans. Raises the bar in the 'quiz book' stakes. 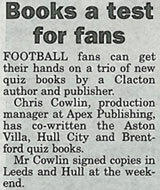 A true test for any Aston Villa fan, fun and enjoyment for all the family. 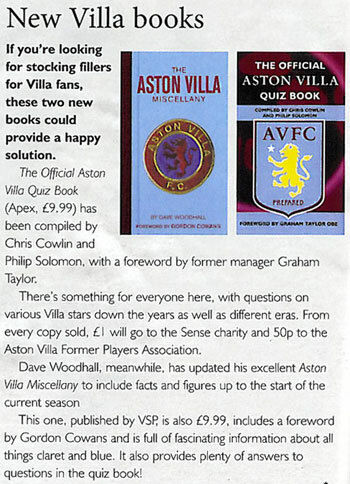 I congratulate Chris and Philip on producing such a terrific quiz book that is full of great questions for Villa fans of all ages. An incredible amount of research has gone into the compilation of this book, which will not only provide hours of fun, but is also a superb reference book on the history of Aston Villa Football Club. I also thank Chris and Philip for generously donating 50 pence from the sale of each book to the Aston Villa Former Players Association that continues to help former players in need and raise millions of pounds for charities and other deserving causes. (Photo: Neil Rioch with a copy of 'The Official Aston Villa Quiz Book'). In May 1987, I took a major decision in my life, by deciding to leave Watford Football Club, who had become an established First Division side, to join Aston Villa who had been relegated into the Second Division. That was bad enough, but on my first day to find that only eleven players – and not all of them senior ones – were on signed contracts confirmed the trouble the club was in. Three years later in 1990 We finished as runners up to Liverpool in the First Division and gained automatic entry to the UEFA Cup for season 1990/91. What did I do? I left to become manager of England. Do I have any regrets? Surprisingly I do not have any regrets of taking on the international role, but I do wish it had come my way some five years later, because I would then have had the opportunity to see exactly what Villa could have achieved with the team I had put together and hopefully with the improvements we would have made. Paul McGrath, David Platt and a young emerging Dwight Yorke would make a great basis for any team! Those three years were indeed memorable ones for me, in what was a difficult time for football in our country. 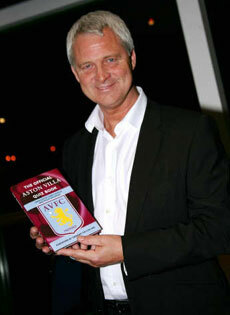 To manage the Villa twice and not get the sack by Chairman Doug Ellis is I think an achievement worthy of recognition! My second spell was nowhere near as successful as my first, but by then Villa were a PLC whose first responsibilities by law are to the shareholders – and supporters and shareholders are not always the same people. 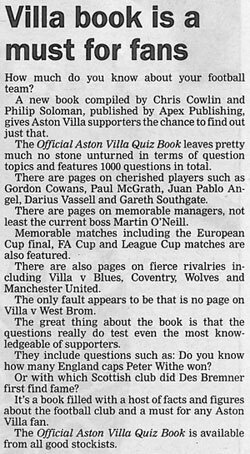 But even allowing for that 15 month period between February 2002 and May 2003, I have always had a good relationship with Villa supporters, and so here is a book of a 1,000 questions compiled by Chris Cowlin for you all to decide how much you really know about your club.For every sale of a copy of this book £1 will be donated to the charity Sense which supports and aids people who are both deaf and blind. Try to imagine yourself like that! Thankyou for your contribution. 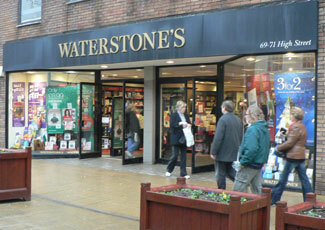 I am thrilled that one pound from every sale of this book will be donated to Sense - the national deafblind charity. Without help like this we would be unable to carry out our vital work of helping children who are deaf and blind have full and happy lives. On their behalf, a big thank you. 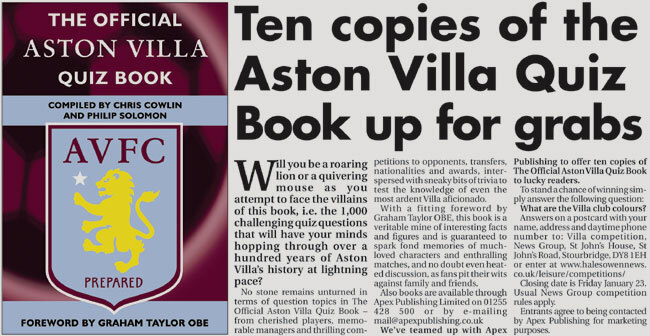 Villa fans young and old will love testing their family and friends with The Official Aston Villa Quiz Book, which is packed full of tricky and entertaining questions about the Villans and their heroes. 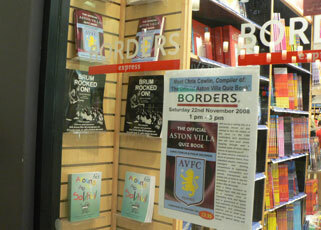 A brilliant book for any Villa fan or in fact for any sports quiz enthusiast ... the perfect Christmas present! Thoughtfully put together ... 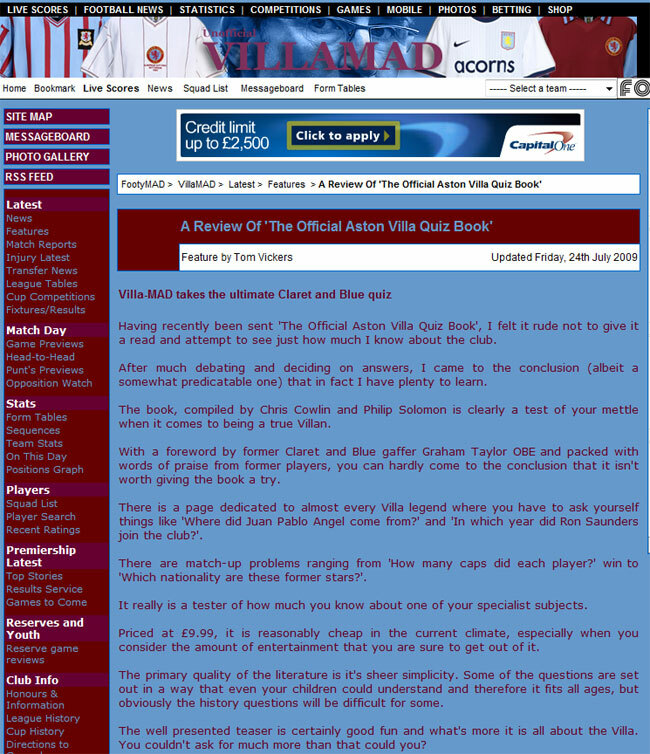 I actually found myself trying to answer the questions and was at it for half an hour ... an essential book for any Villa supporter. 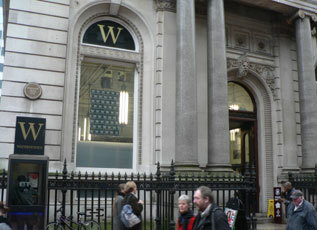 Philip Solomon was interviewed on BBC Radio WM 95.6 FM. 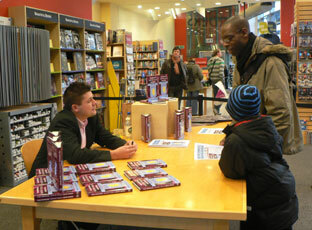 Philip answered questions about his books 'The Official Wolves Quiz Book' and 'The Official Aston Villa Quiz Book'. 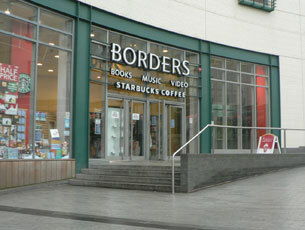 23 December 2013 - Chris Cowlin was interviewed by Wolverhampton City Radio 101.8 FM. 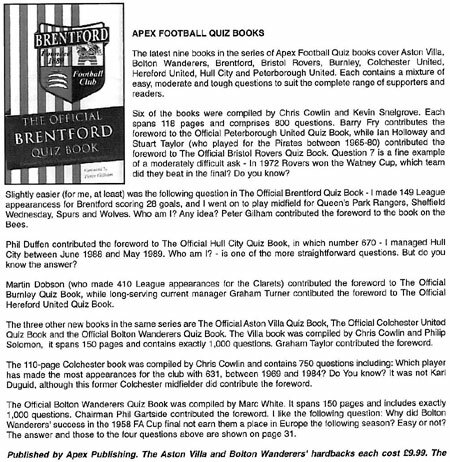 Chris answered questions about his book 'The Official Aston Villa Quiz Book' and also spoke about all of Apex Publishing's titles which were published in 2013. 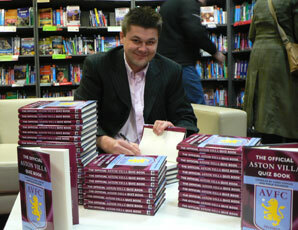 14 November 2010 - Chris Cowlin signed copies of his books 'The Official Birmingham City Quiz Book' and 'The Official Aston Villa Quiz Book' at Waterstone's, Solihull. 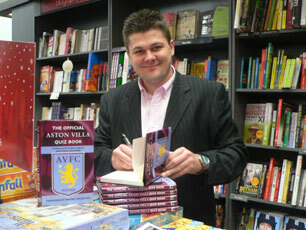 14 November 2010 - Chris Cowlin signed copies of his books 'The Official Birmingham City Quiz Book' and 'The Official Aston Villa Quiz Book' at WH Smith, Solihull. 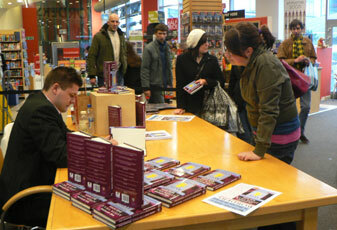 Chris Cowlin signed copies of his book 'The Official Aston Villa Quiz Book' at Borders, Bullring Shopping Centre, Birmingham. 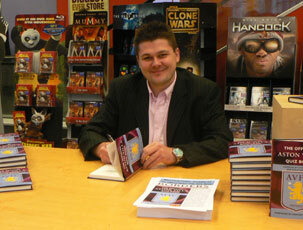 Chris Cowlin signed copies of his book 'The Official Aston Villa Quiz Book' at Waterstone’s, Solihull. 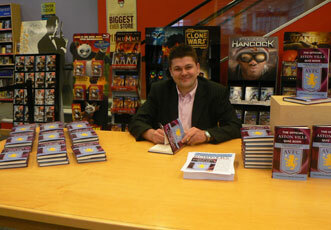 Chris Cowlin signed copies of his book 'The Official Aston Villa Quiz Book' at Waterstone's, New Street, Birmingham. 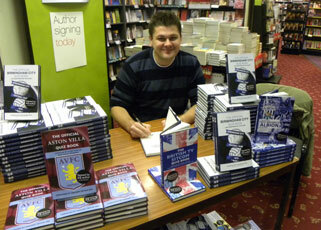 Chris Cowlin signed copies of his book 'The Official Aston Villa Quiz Book' at Waterstone's, High Street, Birmingham. 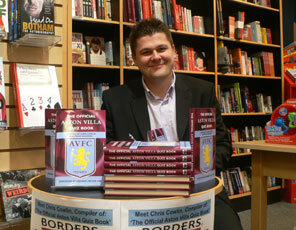 Chris Cowlin signed copies of his book 'The Official Aston Villa Quiz Book' at Borders, Solihull. 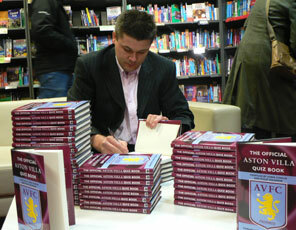 Chris Cowlin signed copies of his book 'The Official Aston Villa Quiz Book' and various other titles at Waterstone's, Solihull. 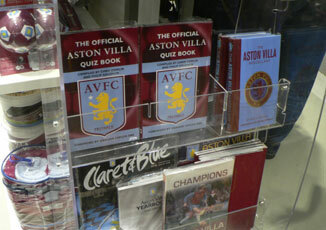 'The Official Aston Villa Quiz Book' on sale at Aston Villa Football Club, Club Shop, Birmingham. 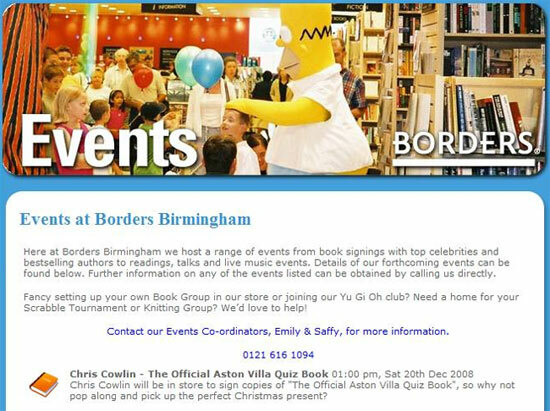 Chris Cowlin signed copies of his book 'The Official Aston Villa Quiz Book' and various other titles at Borders, Bullring Shopping Centre, Birmingham.